When students enter our kindergarten lesson, they play Look 'n Match in groups of 3 - 4. 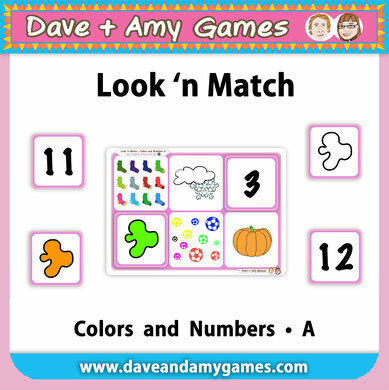 Look 'n Match is a matching game. Students must LOOK at the card and MATCH to the picture on the BOARD. 3. 24 double sided cards to match to the boards. 4. Cards: Pictures on 1 side. Full sentences on back of the cards. (Most beginners CAN'T read the sentences, so why have them? For the FEW students who CAN read. And to encourage non readers to TRY reading. So there is NO CONFUSION as to what the picture is. So the same game can be used with higher levels. 5. Uses the same vocabulary and pictures as in the My English Book and Me 1 and 2 texts. In our lessons, we like students to take control of their learning. So, normally we will place the 4 boards equidistant between the 3 - 4 students. And spread the cards out. Students should pick up a card. Say what it is and match to the picture on the board. Also saying what it is. Speaking out loud. For example, saying: 12 soccer balls. Orange pumpkin. Higher levels should say full sentences. As the students do the game, the teacher should ask more questions. For example, Do you like pumpkins? What color soccer ball do you like? When students finish (all cards on top of all pictures) we will do a double check. Level 1: The teacher points and asks (for example): What’s this? The first child to answer gets the card as a point. Level 2: The teacher doesn’t say the word—-but gives hints. The first child to answer gets the card as a point. Level 3: Children give each other hints. The first child to answer gets the card as a point. 3. It re-enforces the vocabulary in the My English Book and Me 1 and 2 texts. 4. Children LEARN new vocabulary as they MATCH and SAY.